When it comes to the Holocaust, remembering is a serious matter: a moral imperative in fact. However, as the years pass, living memory inevitably diminishes with the death of the survivors, witnesses and the perpetrators. That which must not be forgotten, never forgotten, eventually will be. Life becomes history. 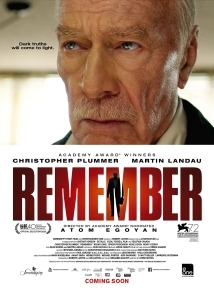 In Canadian director Atom Egoyan’s Remember (2015) the imperative to remember is all the more urgent as the elderly protagonist, a 90-year-old Jew and survivor of the camps Zev Gottman (Christopher Plummer), also suffers from senile dementia. We first meet Zev in the up-scale nursing home where he lives comfortably as a resident. Zev has recently lost his wife, Ruth, but her death spurs him on to complete a mission known only to him and his wheelchair-bound friend Max (Martin Landau, pictured right). To be more precise, it is only intermittently known to him as each morning he awakes, calling for his wife, having forgotten that she has died and the details of his mission of vengeance. For this reason, Max has written everything down in a long letter with detailed instructions. And so Zev absconds from the hospice and begins a cross-country trip to seek out and kill a former Auschwitz blockfuhrer, who is responsible for the murder of his family and who Max has learned is hiding under an assumed name. In the first of many plot-convenience-motivated contrivances in Benjamin August’s screenplay, it turns out there are several Germans living under the same name and this takes the urgency out of the early part of the film as we recognise that generically, the right man can only be caught at the end, if at all. And so the film settles into an ambling geriatric road movie somewhere between Alexander Payne’s About Schmidt (2002) and Paolo Sorrentino’s This Must Be the Place (2011). Zev chats amiably with a little boy on the train, whose knowledge of the Holocaust is precisely zero, but this neither underlines the necessity of Zev’s mission, nor offers pause as new generations grow up with only vague notions of the atrocities. Zev acquires a gun and is helped at every stop by the marvellous logistical support of Max who has booked taxis and reserved hotel rooms in advance. Of course there will be false leads and an array of character actors – Bruno Ganz, Heinz Lieven and Jurgen Prochnow – are called on as Zev hunts his quarry. Although revenge thrillers have recently become the province of the late middle aged, even here there seems to be an upper age limit with Liam Neeson suggesting at sixty-three that he is too old to bring his special set of skills to bear on any more members of the Eastern European Mafia. Egoyan does nothing to alleviate the obstacles of his octogenarian avenger, but the invisibility of the old plays occasionally into Zev’s hands as when crossing a border with an outdated passport he is waved through as no obvious threat. Plummer imbues Zev with a gentle authority and gentlemanly dignity, and though his hand trembles with age, his resolve can turn steely, as when he encounters a younger man (Dean Norris) who retains an admiration for the Third Reich. Remember marks something of a return to form for the Canadian director following the critical mauling of Captives (2014) but the thoughtfulness of Plummer’s performance is not matched by a script that forgets human logic in favour of a narrative tricksiness that ultimately undermines the initially intriguing premise.